Dual or multi-color printing on 3D printers that do have just one extruder can be a tricky thing to do, but it is still possible, though with dual-extruder printers it is much easier. We have been playing with our MakerBot Replicator 2 3D printer in order to make dual-color 3D prints, though the methodology is the same as if you want to be able to print with more than two colors. 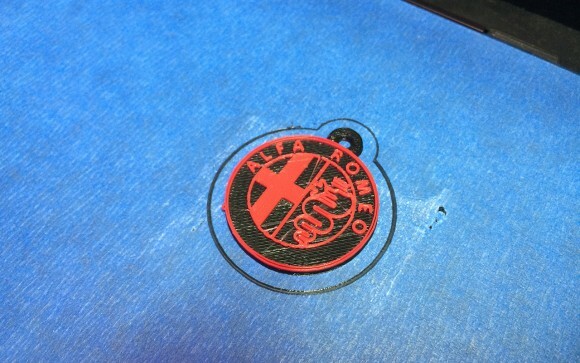 Essentially what you need to do is pause the printing process with one color, replace the filament, then resume printing and you should get a dual or multi-color printed parts as a result. Normally, if you are using a 3D printer that uses GCODE you are able to script the commands to pause the printer to change the filament directly from the 3D model that you are printing, but with Replicator 2 this is unfortunately not possible. The reason for that is the MakerBot Replicator 2 uses the binary X3G format for the model you are printing and scripting a pause in GCODE file and then converting it to X3G does not help resolve the issue either. There are essentially two ways that you can print with dual or multiple colors on MakerBot Replicator 2 3D printer and they are both limiting and not very useful if you want to print a really complex colorful 3D model. 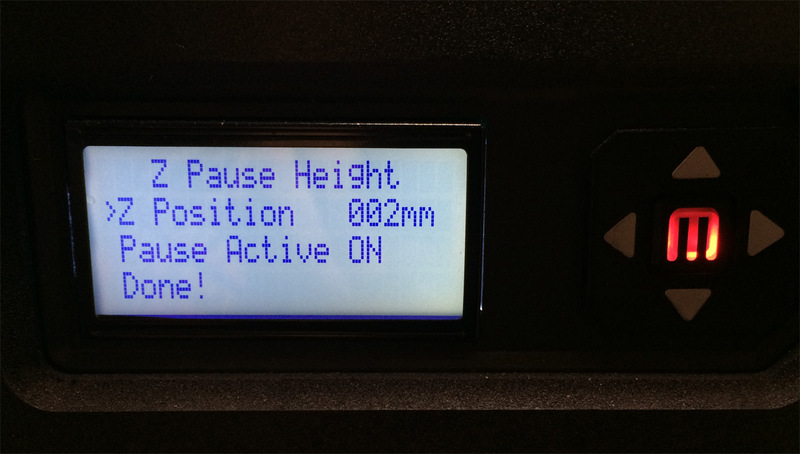 You need to essentially pause the printing process from the device itself, either manually, or by specifying the model height at witch the printer to execute an automatic pause then replace the filament type or color and resume printing. This is just fine if you have a 3D model that has a base with one color and then something on top of it in another color, but if the used colors are being mixed in a single layer, then it is not possible to use this pause/resume solution. So a nicer and smarter solution for multi-color printing on the MakerBot Replicator 2 and other single extruder 3D printers like it would be the upcoming Mosaic accessory, but until then you should do with what you have available. There is also another option that does require you to replace the firmware on your MakerBot Replicator 2 3D printer with one that does support GCODE like the Sailfish Firmware, but we haven’t tried that yet. The drawback of manual pausing and resuming is that you cannot easily get to the same point if you need to make multiple prints of the same model, though it might still be fine if you manage to pause while the infill is being printed. The drawback of the automatic pause is that you can only use values that fractional such as 1.2 mm or 2.3 mm etc, you can use only 1, 2, 3 mm and so on ad object height on the Z axis. If you take this limitation into account when designing the 3D model of the object you are going to be printing it might be fine, but this could be a problem if you want to print an already designed model. While both the methods described above do have their limitations and are far from perfect, you can still get pretty good results printing with dual colors or even more colors if you have the patience. Do note however that the more the colors the higher the chance of issues , our dual color test prints ended up quite well, though not perfect. Again a reminder that the the above options you have for the MakerBot Replicator 2 for pausing and resuming the print will work good if you don’t want to have multiple colors in a single layer of the object you are printing.